A dark brown butterfly which quickly fades to become much paler. A black eye spot with single white pupil is near the forewing tip, surrounded by an orange patch which is more extensive in the female. The underwings are similar, but the eye spot and its orange surround are often hidden behind the hindwing when the butterfly is resting with wings closed – then an angled boundary separates the darker inner wing from the brighter outer part. 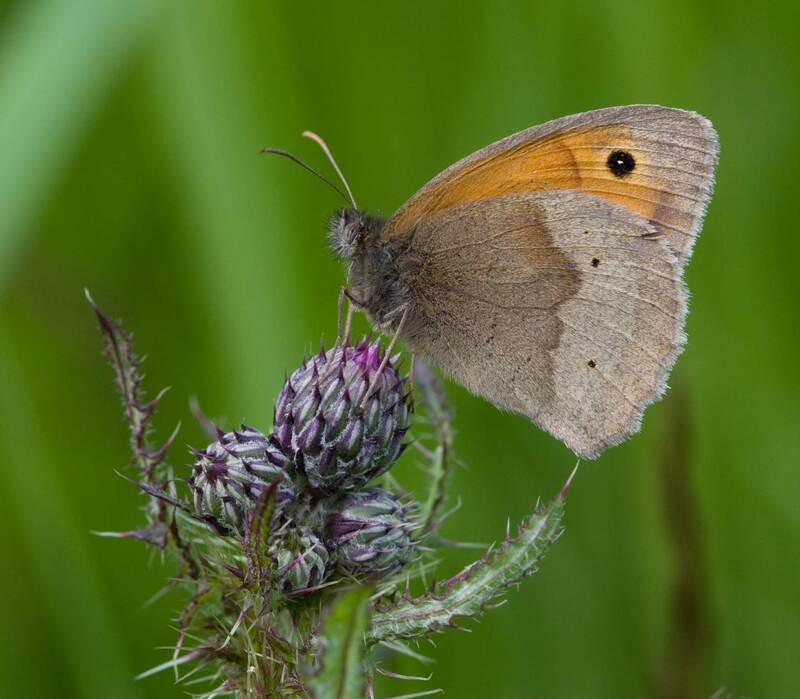 There are also some small black dots on the underwing, where the Gatekeeper has white dots. Abundant in summer, usually flitting quite slowly over the grass, although can fly more rapidly when changing location – or crossing suburban streets! The flight period is from mid-June to mid-September. All over the county, even in urban areas where grass has been allowed to grow undisturbed.